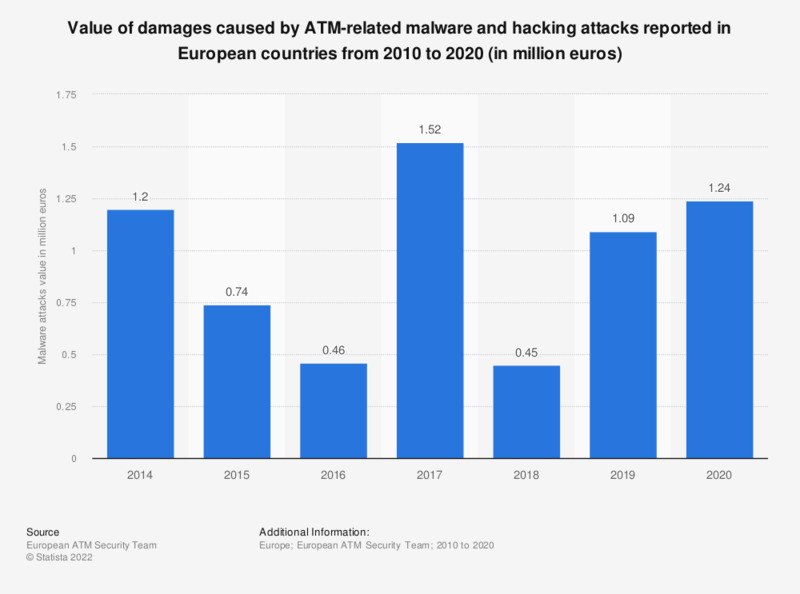 This statistic presents the total damages of reported incidents of malware, hacking and "logical" attacks on the automated teller machines in European countries from 2014 to 2017. The malware and hacking incidents are based on ever evolving cybercriminal techniques, designed to rob customers of their savings either through card or PIN skimming methods (lower-level) or without having to compromise their debit cards, designed to attack the ATMs directly (higher-level). In some of the more sophisticated hack attacks, the access to back-end of ATM machines is used, in order to compromise their security. Reports filed over time showed that the number of malware and "logical" attacks rose between 2014 and 2017, and reached 192 cases as of the latest year. Damages caused by these attacks reached approximately 1.52 million euros in 2017.